When almost all of your personal information is on the web, it becomes very important for Internet companies to make sure that their user’s data is protected and privacy is respected. One glitch, and all of our sensitive data can land up at a place where we don’t wish it to land. Understanding the importance of user’s privacy and security, Electronic Frontier Foundation (EFF) has released their 5th “Who Has Your Back” report for 2015, and the results are shocking. WhatsApp, which has 800 million users all over the world has ranked worst in this report, which means that user’s data and privacy is vulnerable on this app. Thankfully, their parent company, Facebook has fared lot better with 4/5 stars. The companies which are determined to protect your data, and have received 5/5 stars are: Adobe, Apple, Dropbox, WordPress, Yahoo, Credo, Sonic and Wikimedia. Companies which have received 4 stars are: Facebook, LinkedIn, Pinterest, Reddit, Slack, Twitter and Wicker. Google, which is the most widely used search engine has received a dismal 3 stars. 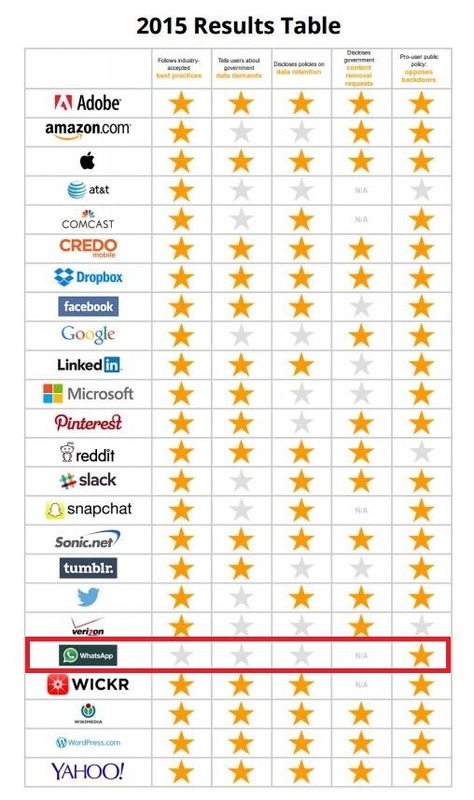 Other major Internet firms with 3 stars include: Amazon, Comcast, Microsoft, Snapchat & Tumblr. AT&T and Verizon, America’s biggest telecom firms have received only 2 stars; and WhatsApp is the only company which has received one star. Does a company require a warrant before handing over user data to the Government? Does the company publish a transparency report on a regular basis? Does the company publish law enforcement guides for enforcing Government’s request for data retrieval? Does the company inform their users about such requests of data retrieval from the Government or any other agency? Categorized under 5 such questions, the ranking was evaluated for 24 such biggest Internet based companies. – WhatsApp was included in this ranking for the first time; and was given 12 months of time to prepare their inclusion by updating and reforming their privacy policies. But nothing positive happened. – Fortunately, 21 out of 24 companies have a robust anti-backdoor policy, which means that they will protect user’s data at any cost. – In 2011, when the report was first published, none of the companies received 5/5 stars, which means that the level of user protection and focus on data protection is increasing. – Regarding notifying users about Government’s data/user retrieval requests, Dropbox has the most authentic and practical policy. You can access the full Who Has Your Back report. Despite Ban, Uber Is Not Only Operational In Delhi, But Now Running A 40% Off Promotion! Apple iOS 11 Anti-Tracking Feature: Advertising Industry Says It Will Kill Internet! WhatsApp on iOS Finally Gets Queue Messaging and Higher Image Upload Limit! AT&T only has one star, not two.